On August 22, 1638, the Battle of Getaria–a naval encounter in the Franco-Spanish War (1635-1659)–took place off the coast of Gipuzkoa. It was won by the French fleet, and marked the first significant victory for the French navy that had been revamped under Cardinal Richelieu, in turn consolidating Richelieu’s position as chief minister under Louis XIII. In June 1638, Richelieu ordered the invasion of the Kingdom of Spain because French territory was surrounded by hostile Habsburg territories as a result of the Thirty Years’ War. The House of Habsburg was the main rival of the French royal House of Bourbon for political power in much of Europe. French forces crossed the border and besieged the Basque border town of Hondarribia in Gipuzkoa. In turn, the army was accompanied by a fleet between 27 and 44 French warships under Henri de Sourdis, whose mission it was to prevent any aid reaching Hondarribia on the part of the Spanish navy. The Battle of Getaria, as depicted by Andries van Eertvelt. Courtesy of Wikimedia Commons. A Spanish fleet, under Admiral Lope de Hoces, was then ordered to attack the French even though it was significantly smaller in size. De Hoces’ ships sailed into the Basque port of Getaria, further along the coast, from which they took up a defensive position from which to engage the French – the shallower waters preventing the larger French ships from close engagement. However, de Sourdis employed a twofold tactic of prior bombardment followed by the sending in of fireships–vessels deliberately set on fire and allowed to drift into an enemy fleet–before cutting off any escape routes with the smaller ships in his fleet. On August 22, the winds were favorable enough to employ the fireship method and the Spanish fleet was destroyed. As a result of the victory, the Kingdom of France came to control the Bay of Biscay, although the siege of Hondarribia was ultimately unsuccessful for the French. The Franco-Spanish War dragged on, somewhat inconclusively, until 1659. However, the end of the war marked an important date in Basque history because the Treaty of the Pyrenees (1659), the official agreement signed between the two countries to end the conflict, established for the first time a definitive international border bisecting Basque territory. As Cameron Watson notes in Modern Basque History: Eighteenth Century to the Present (p. 42). With this treaty, not only was the international border established once and for all, but the two crowns would be unified through marriage (Louis XIV of France would marry the Spanish infanta María Teresa, daughter of the Castilian monarch Felipe IV, the following year), and the king of France, while retaining the title of king of Nafarroa, relinquished any claim to the Nafarroan [territory] within the Castilian political orbit. The treaty thus marked a definitive political partition of the ancient kingdom. Modern Basque History is available free to download here. On the night of September 20, 1615, the eve of the feast of St. Matthew, an expedition of Basque whalers lost their ships in a fjord near Trékyllisvík, Iceland, during a terrible storm. This led to a series of events that culminated in their October massacre at hands of the islanders. The Basque mariners’ bodies, dismembered, would not be buried. However, not all Icelanders saw that massacre with good eyes. One of them, Jón Guðmundsson, better known as Jón lærði (1574–1658) or “the wise man”, wrote an essay on those events in defense of the victims titled “Sönn frásaga” (The true story). 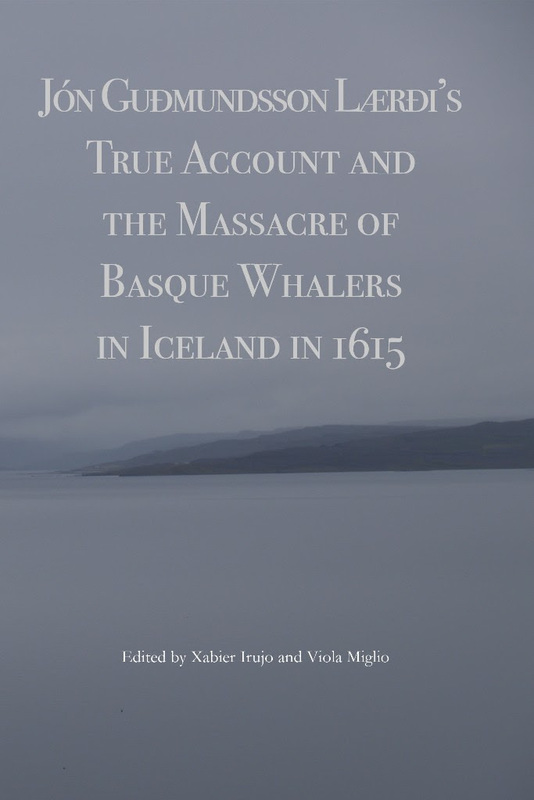 Four hundred years later, on April 20, 2015, an international conference investigated various aspects of this tragic episode of the history of Iceland and the Basque Country. The academic meeting took place at the National Library of Iceland with the participation of experts from all over the world. The program, commemorating the fourth centenary of the massacre of Basque whalers in Iceland, was sponsored by the Government of Gipuzkoa and the Government of Iceland and organized by the Etxepare Institute, the Basque-Finnish Association, the Center for Basque Studies of the University of Nevada, Reno and the Barandiaran Chair of the University of California, Santa Barbara. 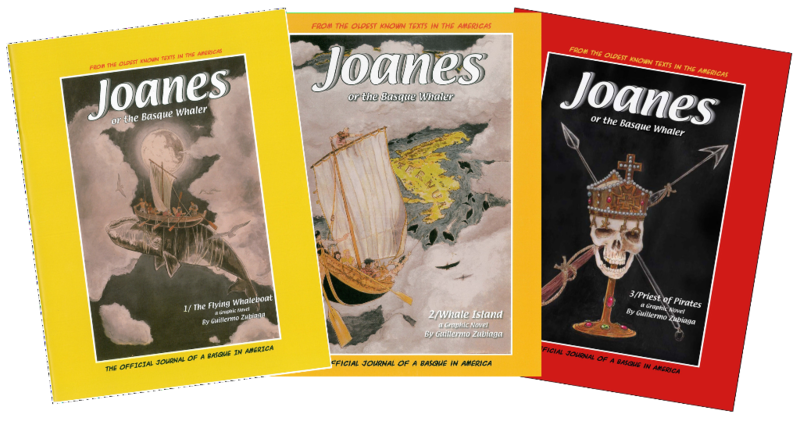 Basque graphic artist’s stunning tale of Joanes, a mythical Basque whaler, and his flying whaleboat. Or buy all 3 together and save! On the evening of August 12, 1912, as they were accustomed to doing every day, the fishermen of several ports along the Bizkaian coast set out in small 40-50 feet boats to fish in the waters close to their homes. This was a form of coastal rather than deep-sea fishing, a typical Basque practice and one intimately linked to the traditional culture of Basque fishing communities as a whole. It had been a mild day with a warming southerly wind, but all of a sudden, as the evening drifted into night, there was a dramatic change, and a cold northerly wind came in from an area of low pressure in the far North Atlantic, around Iceland: an unprecedented phenomenon for that time of year. The air temperature fell dramatically, and the sea became increasingly more squally. At the time a number of these boats were approximately 45-50 miles off of the Bizkaian coast. This would have been just about the moment they were thinking of returning to port with their evening catch, but instead they got caught up in the storm, which carried on ferociously all night and into the morning of August 13. The boats could not cope with such appalling conditions and many sank. On shore, people realized that their loved ones and neighbors were in danger, and an appeal was made to send out rescue launches, but between the terrible conditions at sea and the time it was taking to alert the authorities in Bilbao, help was not immediately forthcoming. In total, there were 143 recorded deaths, most of them fishermen from Bermeo, but including others from Lekeitio, Elantxobe, and Ondarroa. A memorial service was held for all the dead on August 23 in Bermeo, to which King Alfonso XIII also came. The tragedy marked a watershed moment in fishing practices and techniques in the Bay of Biscay. We’d like to share a recent review of William A. Douglass’s new book Basque Explorers in the Pacific Ocean. Published in CritCom: A forum on research and commentary on Europe, Raphael Tsavkko Garcia, a PhD candidate in Human Rights at the University of Deusto, outlines the structure and content of the book, pointing out interesting aspects of Douglass’s new research endeavors. “Basque Explorers in the Pacific Ocean, by William Douglass introduces the reader to how Basques from a tiny territory once pivotal for the whole Iberian Peninsula (comprising the Kingdom of Navarra, later absorbed by Spain, as well as Bizkaia, Guipuzkoa and Araba regions) became an important part of the Spanish colonial empire as administrators and merchants, as well as ship-builders, ship captains, and sailors. Basque explorers took an active part in Spanish expeditions and explorations on the Pacific region (and elsewhere in the world). From the early Spanish expeditions overseas, Basques were among those who helped establish and sustain the Spanish Empire. They played integral roles, whether as ship captains and crew members, or the leaders of successful trade companies and rulers as Spanish proxies in colonial administrations. Douglass’s Basque Explorers in the Pacific Ocean is an interesting and detailed lesson of the period’s history, despite some moments of digression over royal intrigues, which condense into a single book the dispersed knowledge on the role of the Basques in the Pacific, serving as a good guide for future discussions. Going further from the general choosing of describing an explorer’s life, or an expedition’s fate and accomplishments, Douglass seeks to insert different explorers and explorations in a unique context, relating at least two centuries of Spanish naval explorations (and Portuguese) with the formation of the Spanish Empire and its subsequent decline.